I really like this card. Here is the original one I had made. As you can see, I've only changed the card base from Melon Mambo to Bermuda Bay and I added a Basic Black layer behind the main panel. I think that by adding the Basic Black, it allows the Melon Mambo on the main panel to really pop and grab your attention. Again, I used the generation stamping technique, added Dazzling Diamonds glitter to the flower petals and wrapped a length of Melon Mambo Polka Dot ribbon. 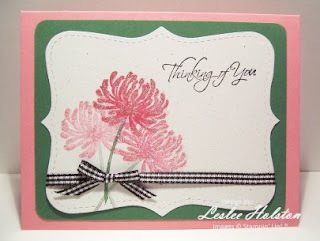 The sentiment is from the same set as the flowers, Kind & Caring Thoughts (a Hostess Level 3 set). This next card is the same. I was just using up some of the card stock I had laying out on my desk. The colors are changed...Cameo Coral base, Garden Green layer with the corners rounded and Naturals White run through the Big Shot using the Top Note die. Of course, I wrapped a length of my fav black & white gingham ribbon. All these cards are beautiful! I don't think I'd be able to pick a favorite. Which one do you like? It goes without saying, this is a super easy card to make and mass produce. Thanks for stopping by today. Come back again soon. I've been on a creative roll lately. I have several more things to show you. 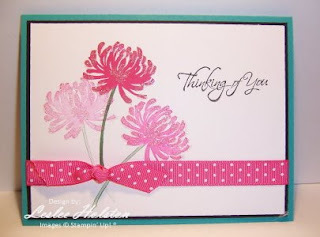 I hope you've been inspired to take one of your beautiful cards and give it a color make-over or two!